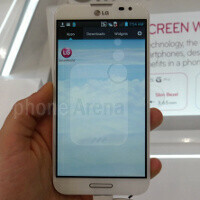 The LG Optimus G Pro is a monstrous phone not just by its size - it is a powerful device with a 13-megapixel rear camera. The megapixels don’t tell the whole story, though, and we have to see the actual camera samples to judge about the image quality. Luckily, we have them. The LG Optimus G Pro performed well on the showroom floor in Barcelona, and while we are yet to test the camera in-depth, here are the first samples we shot. Of course, the camera is also capable of recording videos in 1080p full HD resolution. There is also a front-facing camera for video calls, but right now we’ve focused on the main camera, take a look. Seems to be about average. Good enough for me! Seems like it's struggling with the low light... So the shutter speed is running out to compensate... The colour accuracy looks spot on. Need more samples :) Bring on the full blown camera comparison PA (LG-OGP VS HTC-ONE VS Nokia L920) ! !